As the last days of Summer 2016 are upon us we look ahead to all of the exciting news and events the crisp autumn days will bring. Before we close the door on the season, we bring you some exciting headlines from the week, including more drama for the Haynes House; a cool Pittsburgh Usonian for sale; Lloyd Wright's Palm Springs designs uncovered; after hours at Robie House; and what life in a Alden B. Dow House is like. Check them all out and happy Labor Day weekend — Stay Calm and Wright On! There's a BIG storewide sale going on now through September 6th, 2016. 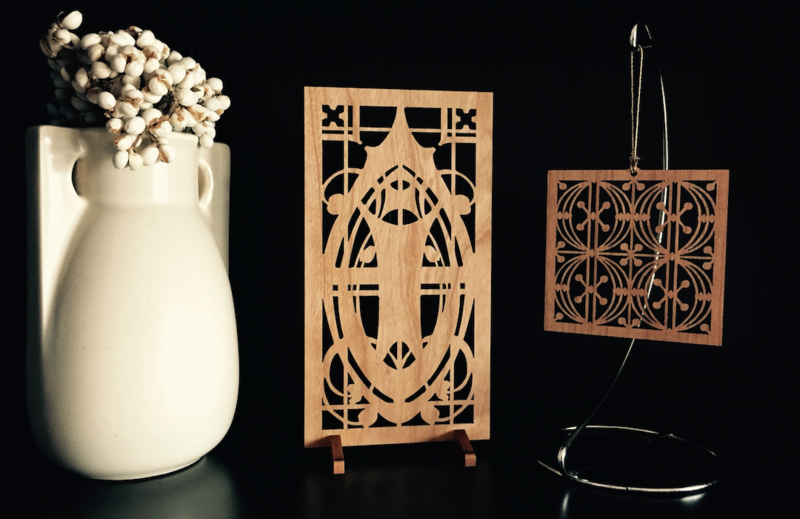 Additionally, we've added several new items to the store like our laser cut Mini Screens and laser cut Ornaments with optional stand (pictured above). It seemed like the Fort Wayne City Council's vote to change the petitioning process would finally shut down the persistent historic de-listing efforts by the owner of the Frank Lloyd Wright-designed John Haynes House. However, the Journal Gazette reports that the owner has opted to continue the battle by filing a lawsuit against the council and historic commission. Follow the link to learn more. Read more. A remarkable little Usonian gem designed in 1950 by Frank Lloyd Wright apprentice and architect Peter Berndtson located in the Stanton Heights area of Pittsburgh, PA has hit the market for the very approachable price of $115,000. Hopefully someone who loves Mid-century Modern and Organic Architecture will snap this beauty up and take good care of it. Check out more info by following the link. Read more. Kathryn S. sends a link to the news reported in Palm Springs Life that some of architect Lloyd Wright’s design features originally created for the Oasis Hotel have been rediscovered as part of a renovation and subsequent opening of the Emerson & Farrar Fine Jewelry store. Follow the link to learn more. Read more. Every Friday evening in October, the Frank Lloyd Wright Trust opens Wright’s Robie House for the public to gather and enjoy live music and refreshments. October After Hours at the Robie House is a chance to explore Wright’s Prairie-style masterpiece, which is usually available only for guided tours and private events. Guests may linger on the balcony and admire the geometric leaded-glass doors, wander the private upstairs spaces and relax with a drink and a snack in the spacious living room. October After Hours takes place Fridays, 5-8 p.m., Oct. 7, 14, 21, and 28, 2016 at the Frederick C. Robie House, 5757 S. Woodlawn Ave., on the University of Chicago campus in the Hyde Park neighborhood. Admission is $35 and $30 for Trust members. A live jazz combo will entertain. Beer, white wine and hors d’oeuvres will be served. Follow the link to learn more. Read more. The Midland Daily News recently featured an article on the new owners of Alden B. Dow's Heath House in Midland, MI which is billed as the architect's first "Unit Block" designs. Follow the link to read more about what it's like living in this MCM dream house. Read more.